Screening Notes: Frank: Where Does Art Come From? 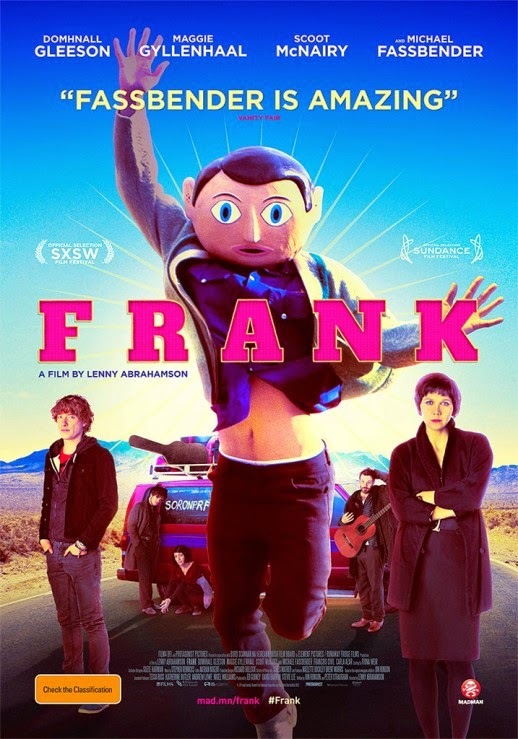 Frank tells the real-life story of Frank Sidebottom, a late-80's, early-90's musical comedy icon. Through its story, it investigates the relationship between trauma and art, and asks where creative inspiration comes from. For someone trying to do something at least mildly creative with his life, there were times where it felt like it was speaking directly to my personal experience. Its story reaches for something real in the nature of art. Jon Burroughs (Domhnall Gleeson) is an untalented musician from a safe, affluent background, and he thinks that the reason his music is no good is that he's never had to struggle with anything in his life. He believes that creativity springs from trauma. He is offered the opportunity to join the eccentric band of Frank Sidebottom (Michael Fassbender), and together they go out into the woods to record an album. The recording doesn't go as smoothly as planned, however, and when their isolation extends to almost a year, Jon begins to think of it as his personal trial, his trauma from which he will draw artistic inspiration. But there's just one problem: Jon's still not a good musician. He still can't write good music. When Jon meets Frank's parents, he discovers the counterpoint to his understanding of trauma. Frank isn't inspired to write music by his hardships, his music is the only thing keeping his hardships at bay. Jon had it backward. Trauma isn't something you need to inspire art, art is something you need to heal trauma. Frank is also another film on the year's immense list of historical biopics, but unlike many of the others it manages to bring its own flavor to the story. It has a strange comedic tone which reflects the chaotic nature of the real band's recording sessions and owes some of its existence to the theater of the absurd. Frank is an incredibly unique character, and the movie injects a bit of irrationality into the atmosphere to match his distinct personality. In order to contain this chaos, the film constructs around it a fairly familiar basic story structure with a few too many obvious screenwriting conventions. Jon functions as a rather plain fish-out-of-water stereotype, and his voiceover blogging serves as conspicuous narrative exposition. He's well played by Gleeson (he's a pleasure to laugh at), but his character is nothing special. Frank himself, on the other hand, is a fresh new character for me, and he's wonderfully played by Fassbender. Without the use of his face, he's forced to carry the film with his voice and his physical performance (he does a marvelous job acting with his hands). The movie around him may not be the best at times, but it succeeds in capturing something special about this troubled artist.